FoxNews.com title: "Revolution Comes to the Middle East -- A Look at Libya, Egypt, Syria and Yemen"
After decades of stasis, the Middle East is in uproar. With too much going on to focus on a single place, here's a review of developments in four key countries. 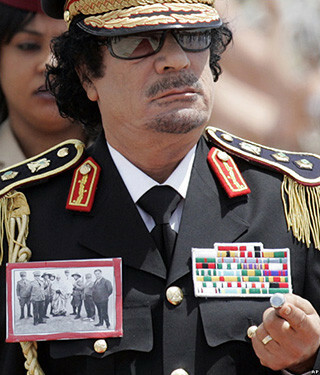 Mu'ammar al-Qaddafi in full military splendor. Libya: With most Americans not quite realizing it, their government haphazardly went to war on Mar. 19 versus Mu'ammar al-Qaddafi's Libya. Hostilities were barely acknowledged, covered with euphemism ("kinetic military action, particularly on the front end") and without a clear goal. Two Obama administration principals were out of the country – the president in Chile, the secretary of state in France. Members of Congress, not consulted, responded angrily across the political spectrum. Some analysts discerned a precedent for militarily attacking Israel. Perhaps Obama will be lucky and Qaddafi will collapse quickly. But no one knows who the rebels are and the open-ended effort could well become protracted, costly, terroristic, and politically unpopular. If so, Libya risks becoming Obama's Iraq – or worse if Islamists take over the country. Obama wants the United States to be "one of the partners among many" in Libya and wishes he were president of China, suggesting that this war offers a grand experiment for the U.S. government to pretend it is Belgium. I admit to some sympathy for this approach; in 1997, I complained that, time and again, because Washington rushed in and took responsibility for maintaining order, "The American adult rendered others child-like." I urged Washington to show more reserve, letting others come to it and request assistance. That's what Obama, in his clumsy and ill-prepared way, has done. The results will surely influence future U.S. policy. Egypt: The Supreme Council of the Armed Forces sponsored a constitutional referendum on Mar. 19 that passed 77-23. It has had the effect of boosting the Muslim Brotherhood as well as remnants of Hosni Mubarak's National Democratic Party, while shunting aside the Tahrir Square secularists. In so doing, the new military leadership confirmed its intention to continue with the government's subtle but long-standing collusion with Islamists. Two facts underpin this collusion: Egypt has been ruled by the military since a 1952 coup d'état; and the so-called Free Officers who carried off that coup themselves had close ties to the military wing of the Muslim Brotherhood. The "Free Officers" in 1952. 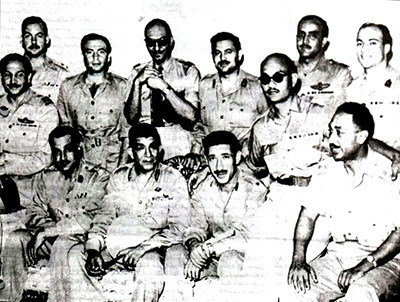 Note Gamal Abdel Nasser seated at the far left and Anwar el-Sadat seated at the far right. The spirit of Tahrir Square was real and may eventually prevail; but for now, it's business as usual in Egypt, with the government continuing Mubarak's familiar quasi-Islamist line. 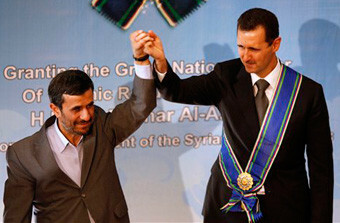 Mahmoud Ahmadinejad fetes Bashar al-Assad in Tehran in 2010. Syria: Hafez al-Assad ruled the country for thirty years (1970-2000) with brutality and nonpareil cunning. Seized by monarchical pretensions, he bequeathed the presidency to his 34-year-old son, Bashar. Training to become an ophthalmologist, Bashar joined the family business under duress only after the death of his more capable brother Basil in 1994, basically maintaining his father's megalomaniac policies, thereby extending the country's stagnancy, repression, and poverty. As 2011's winds of change reached Syria, crowds yelling Suriya, hurriya ("Syria, freedom") lost their fear of the baby dictator. Panicked, Bashar wove between violence and appeasement. If the Assad dynasty meets its demise, this will have potentially ruinous consequences for the minority Alawi community from which it derives. Sunni Islamists who have the inside track to succeed the Assads will probably withdraw Syria from the Iranian-led "resistance" bloc, meaning that a change of regime will have mixed implications for the West, and for Israel especially. Yemen: Yemen presents the greatest likelihood of regime overthrow and the greatest chance of Islamists gaining power. However deficient an autocrat and however circumscribed his power, the wily Ali Abdullah Saleh, in office since 1978, has been about as good an ally the West could hope for, notwithstanding his ties to Saddam Hussein and the Islamic Republic of Iran, to exert control over the hinterlands, limit incitement, and fight Al-Qaeda. His incompetent handling of protests has alienated even the military leadership (from which he comes) and his own Hashid tribe, suggesting he will leave power with little control over what follows him. Given the country's tribal structure, the widespread distribution of arms, the Sunni-Shi'i divide, the mountainous terrain, and impeding drought, an Islamist-tinged anarchy (as in Afghanistan) looms as a likely outcome. In Libya, Syria, and Yemen – but less so in Egypt – Islamists have opportunities significantly to expand their power. How well will the former Muslim inhabiting the White House,* so adamant about "mutual respect" in U.S. relations with Muslims, protect Western interests against this threat? Egypt's armed forces have detained and tried thousands of people since taking control of the country this year, according to human rights and legal activists, who see it as a sign that the toppling of a president was just the start of Egyptians' battle for democracy. In the weeks that followed President Hosni Mubarak's ouster Feb. 11, they say, the country's security agencies have been weakened, but the military has continued many of its repressive practices and a hated emergency law that allows random arrests is still in place. "We have another battle ahead with the army," said Mona Seif, an activist with the Hisham Mubarak Law Center, a legal firm that works in the human rights field. "The army has a big part of it still loyal to the old regime. They have economic interests in the old system. They won't let go of that easily." ... Far from shepherding Egypt to democracy, activists say, the military is governing according to decrees similar to those relied on by Mubarak. Egypt's ruling generals said in comments published Tuesday they would not allow extremist groups to take over the country and that they prefer to see a moderate religious ideology prevail in the mainly Muslim nation. The comments by three members of the ruling Supreme Council of the Armed Forces appeared designed to calm growing fears that militant Islamic groups now operating openly will try to impose their strict interpretation of Islam on Egypt. They also appeared to serve as a warning to militant groups against taking advantage of the country's precarious security and the freedoms allowed after the February ouster of longtime leader Hosni Mubarak to break the law. * FoxNews.com changed this phrase to "How well will our president, the current occupant of the White House." Related Topics: Middle East patterns, US policy | Daniel Pipes receive the latest by email: subscribe to the free mef mailing list This text may be reposted or forwarded so long as it is presented as an integral whole with complete and accurate information provided about its author, date, place of publication, and original URL.